One of the biggest personal and professional lessons I’ve learned running a nonprofit and creating a TV/Web show (stay tuned) is to enjoy the yellow light. I used to freak out when things got slow. In a society that covets being busy and doing more, consuming more, it’s hard not to jump in the fast lane and hit the accelerator when life seems like it's plodding along. A friend and fellow soul-jah posted this amazing meme on Facebook recently and I thought when I finally learned this seminal life lesson, I became less frantic, less of a worry-wart and more aware. Aware of what was going right. Aware that it’s OK to pause in life. Aware that I’m on the right track. This quote inspired me to reflect on each of the different seasons of life and realize the value in each. You see, life is amazing: Why? Because you’re breathing. You were born. You’re unique and you’re the only person experiencing what you’re going through here and now. You choose which lens to put on: one that lets in more sun or one that blocks out the goodness. For goodness sake, don’t choose the latter! 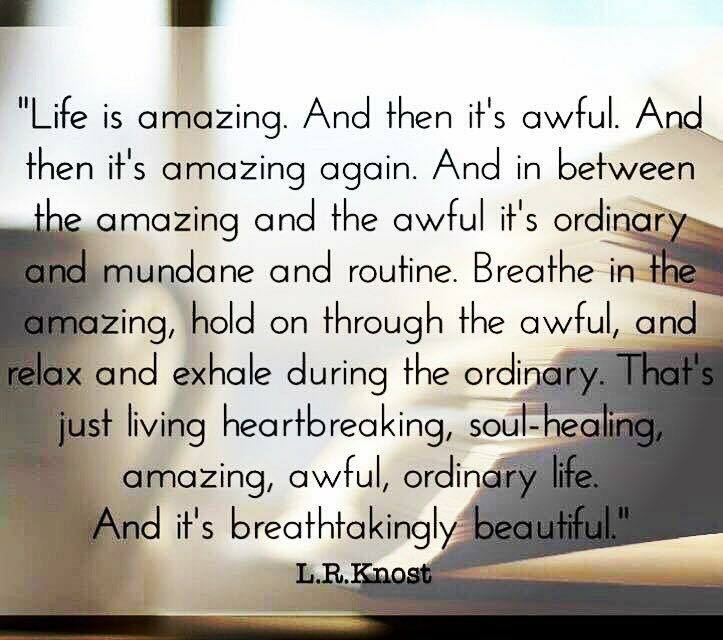 Life is amazing: Then life gets amazing again. Like scattered dots, life’s experiences can be connected when you learn what these experiences are trying to teach you -- leading you to your truest, highest-possible potential. All the awful, aforementioned things that I’ve experienced led me to my life’s work, Go Inspire Go, to find everyday heroes and tell their authentic stories, so you can find the hero in you to help. Life is ordinary and mundane: When I travel for work, reporting on everyday heroes or just for vacation, I yearn for routine. Going to my CrossFit box and seeing the usuals while working out my body, sweating, getting stronger. Buying groceries at the corner store or my early Saturday walks to the waterfront to the farmers’ market and having dinner with loved ones. This happens most of the time – so much more than ups and downs – so enjoy it. My friend and spiritual sister Terrie Crowley told me when things are quiet, it’s God letting you rest. So rest and say, "Thank you." 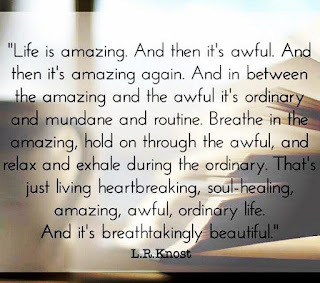 Life is breathtakingly beautiful: It’s so easy to "be busy" and "addicted" to the highs in life. But when things fall apart, as they do for all human beings, you learn the most and feel the most. If I could only hold a mirror up to everyone I meet and say you matter, you gem, you will see and realize that you are beautiful. The sun that rises is beautiful. Your interactions with loved ones are beautiful. The confluence of blessings that have come together to make you and your life is beautiful. So just be… and enjoy. Try this exercise out and see how breathtakingly beautiful life is unfolding through your lens. Paulo Coelho, the author of one of my favorite books, “The Alchemist,” believes we all will face many challenges while pursuing our dreams. When the biggest challenges come and we face tests, “That’s the point at which most people give up,” he wrote. Coelho isn’t just all talk – he’s walking this journey. When he was in his forties, he was broke and almost out of hope. Something inside him needed to be expressed. 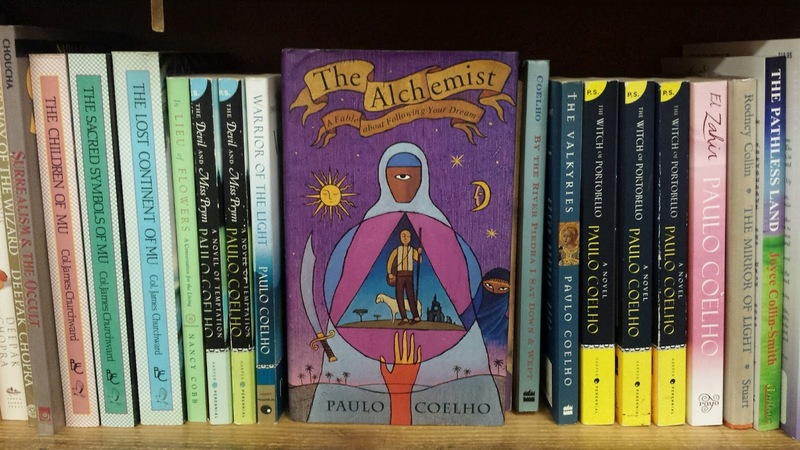 The result was “The Alchemist,” a record-breaking, breathtaking literary treasure. 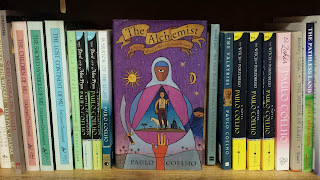 Recently, during several conversations with friends about keeping hope alive, I found myself sharing this remarkable story about how Coelho’s book, “The Alchemist” – a story about Santiago, an Andalusian shepherd boy in search of his dream – went from selling two copies and being dropped by his publishing house to setting a Guinness World Record for being the most translated book by a living author. Coelho told Oprah during a Super Soul Sunday interview that after cutting ties with his publishing house, he went to one of the biggest publishers in Brazil and told them that this would sell. They said, “OK” and the rest was history. According to Oprah.com, the book has sold more than 65 million copies, has been translated into more than 80 languages and has been on the New York Times bestseller list for more than 300 weeks. Like a caterpillar that climbs into a tree and forms a cocoon, something bigger is guiding us. We just have to struggle and strengthen our wings as the butterfly emerges. How does this happen when the caterpillar has never done this before? We are guided by something bigger than ourselves. I believe that we all have a calling. That’s why we’re here breathing. The goal: to find your power so you can not only feel your potential, but go beyond it by using it to uplift and help others. There is no better gift you can give than the gift of you. Share your story, lift someone’s spirit and shift them forever. The challenges you face are here to guide you. 1. Share your story. I’ve done keynotes for Coca-Cola, Rotary clubs and many other nonprofits about having the courage to tell your story. Many people have since come to me, crying, telling me they didn’t think their stories mattered. The truth is, everybody’s story matters. Have the courage to discover and share them. You give others permission to do the same. This raises compassion, leads to action and inspires hope and change for the storyteller and the listener. Don’t know what story to share yet? Share Coelho’s! 2. If your dream, business idea or project is authentically you, the people, the opportunities and signs will come. My mantra: Trust and action = traction. If you have any other action tips on how you’ve kept hope alive, please share in the comments section.